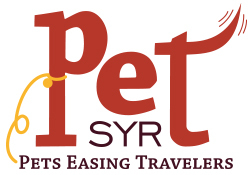 Syracuse Hancock International Airport is proud to partner with PAWS of CNY to offer our new Pets Easing Travelers (PET) Program! The PET program brings friendly certified therapy dogs to our terminal to help ease travel anxiety of nervous fliers and their families. 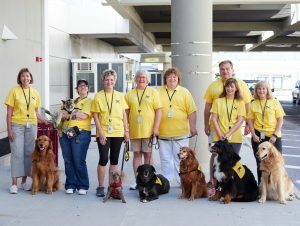 PAWS of CNY’s professional, in-service therapy dogs and their owners/handlers will be at the airport on a weekly basis. Look for the PET Program volunteer handles in their yellow shirts and the dogs in their yellow vests and bandanas. The dogs are always eager to nuzzle up to animal lovers and get their share of petting and hugs!